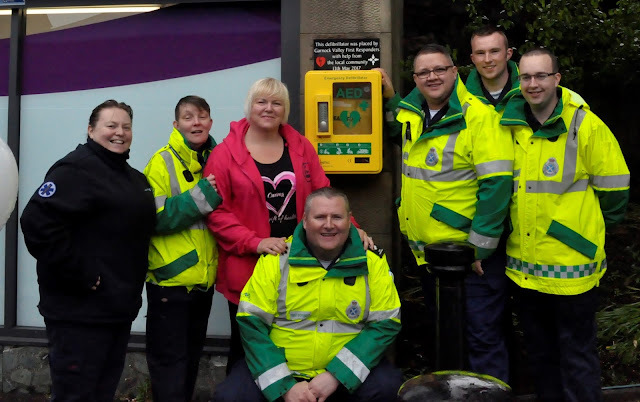 Another community event was when a new defibrillator was installed on the wall at Curves. The Garnock Valley First Responders previously held fundraising events to purchase the defibrillator and also to have a special event on the day of the installation. The event was held on a very wet and dismal day but proceeded regardless. The Emergency Services Response Vehicle was set up in the parking area at the Community Garden and crew attended along with the First Responders and Police. 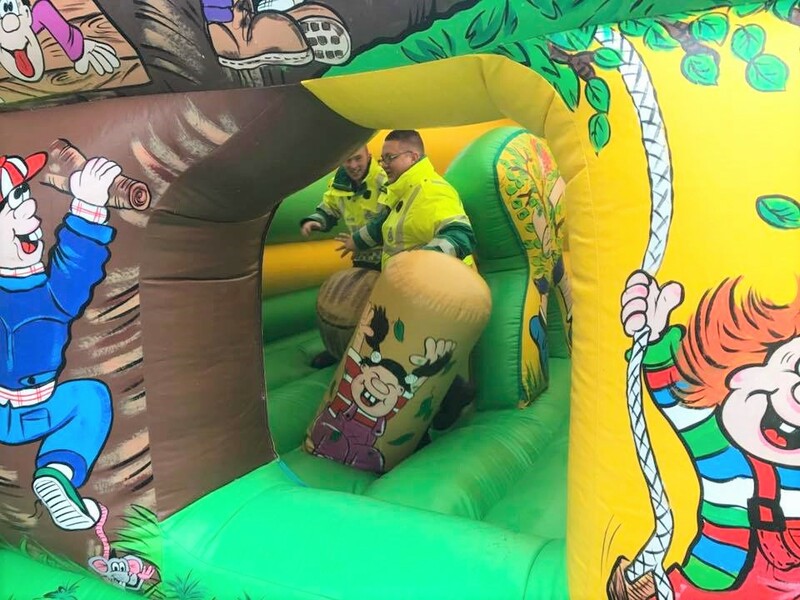 There was a very wet Bouncy Castle located beside Curves and the First Responders had their gazebo there and were distributing free hot dogs and other goodies. 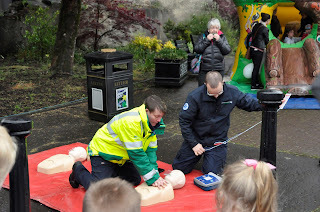 They also demonstrated how a defibrillator works. These defibrillators are fully automatic machines and can be used by anyone who has never handled one before. When switched on, the machine talks the operator through the stages of administering the unit. Anyone requiring to use the machine, first of all requires to telephone the number indicated on the weatherproof housing (which is locked) in order to gain access to the machine. 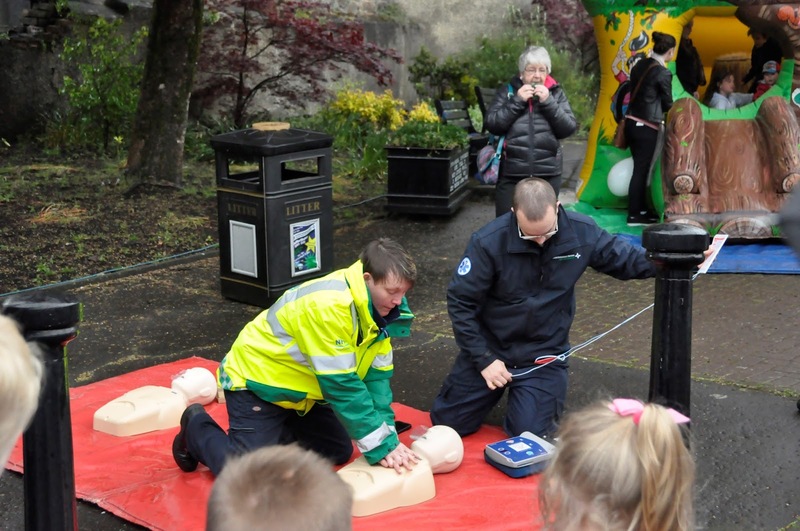 The First Responders not only help to save lives, but are very much involved in various local community events in the area. 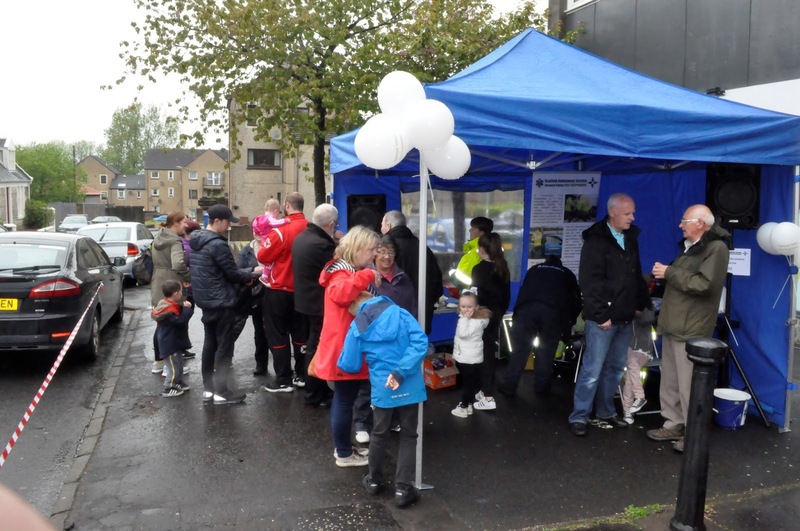 A permanent operating base has been a priority for them and finally, after being in various locations in Beith, they are now based in Kilbirnie. There are various First Aid Courses available where you can learn basic first aid, and also how to use a defibrillator. During the summer Audrey, Caroline, Joyce and Paul continued to do a great deal of additional work on the garden, both keeping it in order and planting lots more shrubs and plants etc. They have done a fantastic job. When we finally arrived home, we went up to the garden via the Main Street and on turning the corner into the garden - WOW, what a sight, all the flowers were in full bloom and the banking was full of nasturtiums, what an array of colour. As can be seen from this picture there has been a great deal of work done to make the garden attractive to all. Beith Development Trust helped by including the garden in the Main Street revamp project and have painted the stair, provided a red Community Garden Board and a sign above the notice board which we had installed some time before the opening day. The Trust also provided the gazebo/bandstand which will be seen at the top of the high area. The picnic table at the high area was donated by the Community Pay Back team. Audrey Addies' guides painted the tiles which can be seen on the newly bricked up section behind the blue picnic bench. This bench was donated by Taigh Mor Care Home. This is the gazebo donated by the trust. 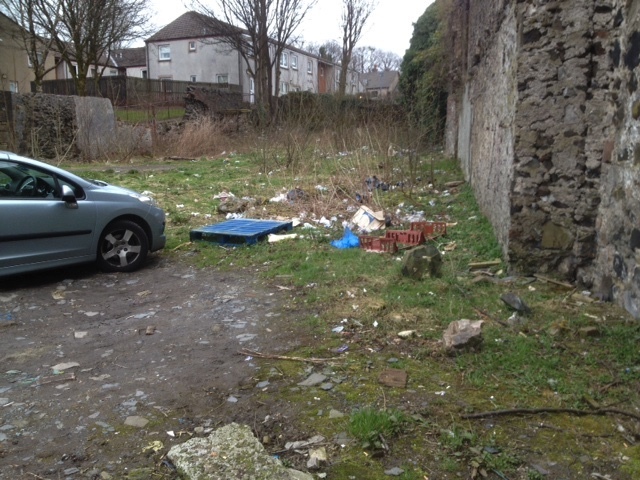 Litter picking is done regularly by several individuals including ourselves. Brian Smith and his grandson and Fergus Highgate always pick on their way past. Streetscene provided the bin and we change the bag when it is full and place it beside the bin already in position just round the corner in Main Street. Rose and Caroline enjoying a cuppa during a break from work. 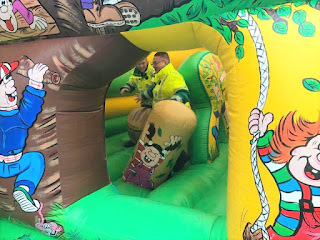 At last year's Christmas Lights & Laughter event, John Irvine arrived with his big fairground ride and set it up from the pavement right up past the mid-way of the garden, this did a little damage but all was made good again with the assistance of the always helpful John Smith of Smith Brothers Ltd. When visiting the Snowdrop Festival in Dalry at Blair Estate, we asked if it would be possible to have some of the tree sections which had been cut so that we could make a table and wee seats for little people. These were given gladly and are now in place. One wee lad comes in several times a week to see if his worm is still under one if the blocks, as expected the worms are always there. You will see we have also installed several vegetable planters after receiving a grant from the Trust. These have been very well used by unknown locals. One lady brought her wee granddaughter in and described how she used to carry a bag of sugar and dip a stalk of rhubarb in it as a treat - Hopefully these days are not yet departed! The planters contain Rhubarb, Gooseberries, Tomatoes, Cabbage, Strawberries and several herbs which are there for use by anyone who wishes to use them. The cabbages were well used, mainly before they were mature, however that is why the produce is there - to be used. 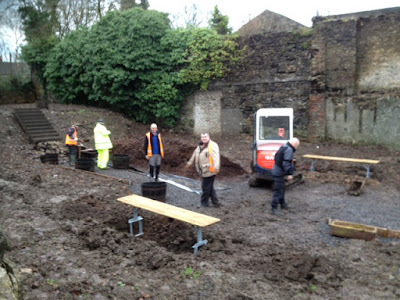 We have another planter which has still to be installed and will be shortly if we can get a break in the weather. Recently the Townhouse celebrated their 200th anniversary and the small parade assembled in the garden before setting off along the Main Street heading to the Townhouse. This was a great day for the town and something which will add to the history of the area. Everyone was dressed in period costume which really made it an "occasion". A serious amount of time, research and work goes into these kind of events. Opposite is the red sign donated by the Trust and also some tiles which have been painted and by Caroline's granddaughter Annaliese and installed by Harry, her granddad. Readers will have by this time seen how great a community effort the garden has been and how it has given the town something which they can be proud of. This is the day we have all been looking forward to. Before we ramble on we must say a big thanks to Donald L Reid for providing the photos of the day and everyone who has been involved in any way to make this project happen. We had approached Morrisons store, enquiring if they could help in any way to make the day memorable. They not only supplied lots of goodies, cup cakes and donated home baking, they also donated the hot dogs and rolls. Previously Morrisons had donated 2 lovely wee Olive trees which were planted on either side of the stair. The Community Centre provided the use of a bain marie so that the food could be kept hot. We felt very humbled on the day by the many folks who helped with setting up and allocating the food. The setting up was done in good time, again in light rain but the day cleared up well. Some names who helped set up were Billy and Janette Edmunds, Joyce and Paul Cavanagh, Caroline Shields, Audrey Addies and family, The Trefoil Guild and many more. The Guides also gave lots of help and have continued to help in many ways. Gordon Wilson piped the event in and remained all day meeting friends old and new. Dionne the face painter did her artistry on lots of faces. Dr Audrey Sutton NAC delighted us when she carried out the official opening, she also donated a lovely wee acer. The table behind shows some of the trefoil guild ready to provide the goodies. Guides, Sally Williams and her daughter. Shortly after the opening day, we were heading off on our annual touring holiday in Canada and as we were about to be away for some time, we appealed for volunteers to look after the garden in our absence. We had a great response and the garden was looking brilliant when we came back several months later. The stalwarts of the team were Caroline Shields, Audrey Addies and family and Joyce and Paul Cavanagh who regularly attended and planted many more plants and kept the weeds down. Others who helped included Lisa Dunlop who continued to donate painted stones and Sylvia Tricker. The next blog will take us from the late summer 2016. There is still a lot of work to do leading up to the day of opening. 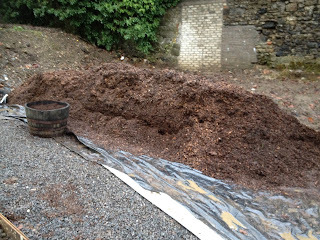 David Scott has now delivered several loads of wood chippings which are in process of being spread and we have also had several loads of 19mm stone delivered. As always, the John Muir Trust have assisted with the spreading of the wood chip, and the Community Pay Back squad have done wonders with the stone. Individuals have also helped when they can with the back breaking toil. Altogether this has been a fantastic community effort and the results are now beginning to be seen and appreciated by the town folks. We are now at the point where we have started to install plants and shrubs in the various tubs and on the banking ready for the opening day which has been decided on as the end of May 2016 prior to us heading off for our last trip in our old motorhome in Canada. 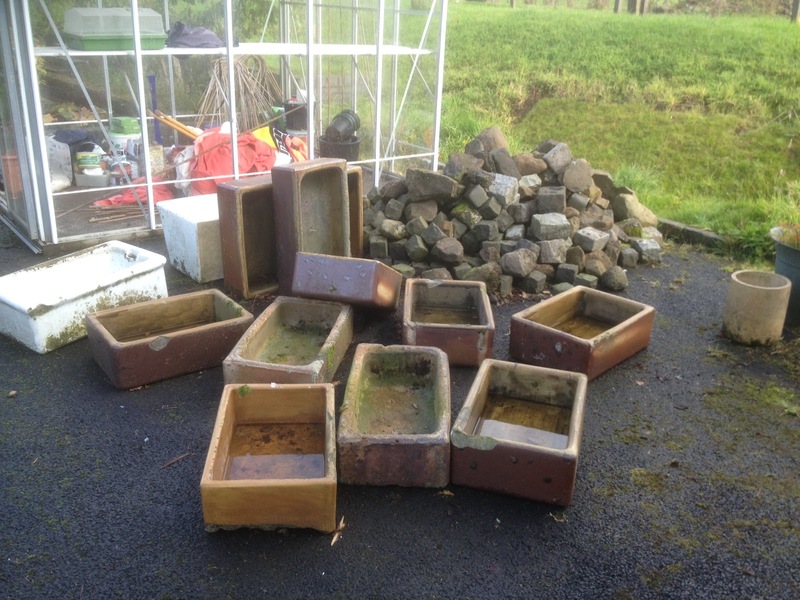 Many folk have donated plants, and tubs already containing plants. Ann Clark being the largest donor to date. There was a flurry of activity leading up to the opening which was very well attended. The set-up in the morning was again damp but as time went on the weather brightened and we had a good day. By this time we had received grants and donations of necessary money which allowed us to achieve great progress. The main donations have been from North Ayrshire Council and the Christian Action Group (Thrift Shop), plus many individual cash donations. All donations are recorded on the information board. We worked diligently and toiled on with everything now starting to look like a garden and much better than had been anticipated. As the work progressed, many more donations of plants and planters were received. With the project now nearing the grand opening day and everyone working flat out to help to make it happen, we must record our sincere thanks to everyone who has taken an interest in the area. Some sceptics have commented that it couldn't happen and that it would be subject to damage and theft, however the whole project has met with nothing but enthusiasm from far and wide and has proved to be a great asset to the town. This photo is taken just the day before the grand opening and mainly shows the progress from a badly littered area to a very acceptable and nice place, albeit in the rain. 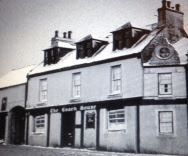 We will take a look back in time to when the site was the location of a hotel (The Coach House) which had become derelict and was subsequently demolished and became a dumping ground for all sorts of rubbish. When we organised the annual litter pick in 2015, we had asked the scouts to clear as much litter from the site as they could. 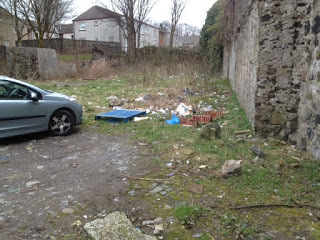 They did a fine job and when I looked at it afterwards I wondered if we could do something better for the town. 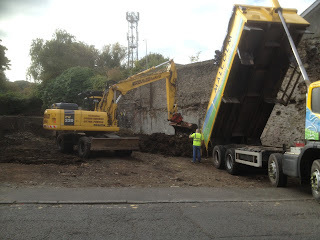 On approaching the site owner, he agreed that we could use the site until such time as he planned to use it. Our plan was simply to tidy up the area and provide some seating and flower tubs, however as will be seen the whole thing has blossomed and become a real asset to the town, thanks to the great help we have had from many sources by way of donations, funding and general help along the way. This is when the project began to take shape. Colin McVey of Valleycraft used bricks supplied by Douglas Biggar and bricked up the hole in the wall at the right rear of the site, this had at some time previous been boarded up and the board was both loose and decaying. We then asked the community pay back team if they could help by cutting down all the shrubs and small trees which had established. Once the undergrowth had been cleared, tree surgeon David Scott shredded all the wood. 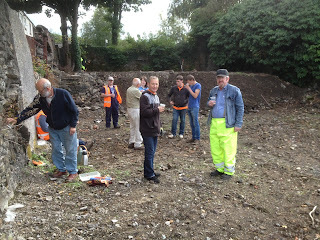 This was followed by Guy Tulloh measuring the site and producing 3 different layouts of what could be done with the site. Martin McLeod then came in with his JCB and in only 3 hours completely transformed the site, levelling it and making a raised area at the rear which is intended to be an area where outdoor concerts or other activities can take place in better weather. 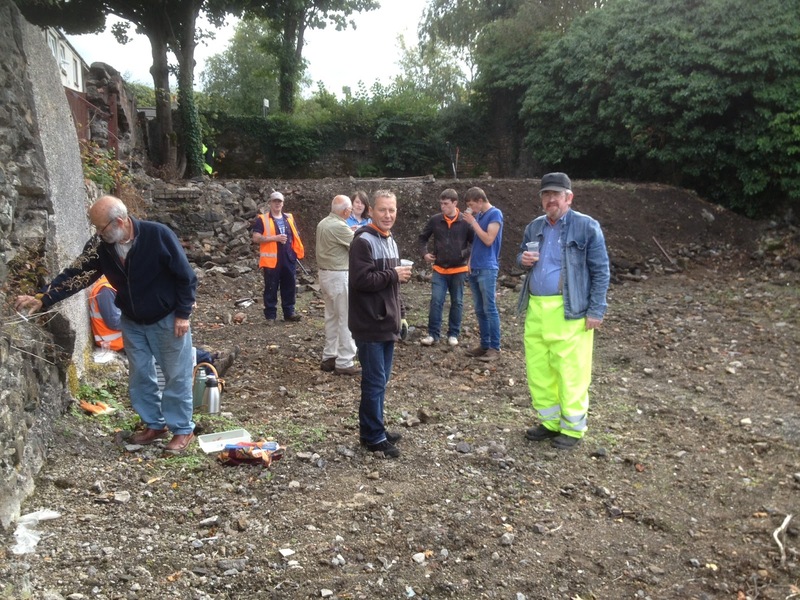 This is when we asked the John Muir Trust team headed by Stewart Beck if they could help with the making of the site. (Stewart has also helped with setting up of this Blog for which we thank him sincerely) This team were the ones who really made the difference and every week over the winter of 2015 they turned up in any weather. Many of Stewart's team were in process of looking for work and during the time with us, several have been successful in finding jobs. They have been a great lot, both male and female, always cheery and willing to do anything asked of them. (Every time we met, we had a tea break mid way and Rose made wee buns or scones and I made the pancakes we had tea and coffee, mainly in the rain). At this point it has to be said that Scott from Barrington House always came along and enjoyed his tea. While Scott wasn't able to do a lot of the work he was an inspiration and kept us all busy with his various questions and advice. Everyone has something to offer in a project like this and it has been inspiring to see what has been offered by many individuals and businesses in the town. When the drawing was produced the site was levelled and cleared, and all ready to go, we were supplied with many loads of top soil (the donor wishes to remain anonymous) which proved to be mainly heavy clay. However we toiled on and did what we could, this was back breaking work as anyone who has worked with heavy clay will testify. While it is difficult to handle, what we have is full of worms and is extremely fertile and many plants thrive on it. Gordon McLeod came along when the soil was being delivered and generally laid out the site according to the drawing.